Discovery Charters provides adventure tours in the pristine waters of Lake Superior. 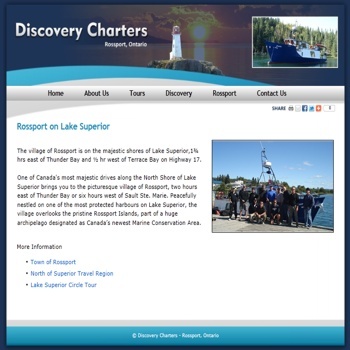 Operating out of Rossport, Discovery provides quick access to amazing sites in Lake Superior. Owner and operator Paul Turpin has years of experience and a wealth of knowledge navigating Lake Superior’s magnificent waters. Explore the magnificent Rossport islands.. Described as “a Cathedral without Pillars” and, sometimes, “the Peggy Cove of the North”, the Rossport area is a nature lover’s paradise. In 1911 the luxury steam yacht Gunilda foundered on the McGarvey Shoal and sank 8 kilometers from Rossport. This is a world class dive site. Explore the inlets and islands on the North shore of Lake Superior in areas only accessible by water. Book a tour of the area and sit back and enjoy the untouched scenery. Don’t forget your camera!